South Africa has always been a country with problems of water scarcity. The ominous Day Zero narrative in Cape Town has brought water security into our daily lives and has made us pay closer attention to issues of water demand and availability. Additional challenges, including pollution, poor management and infrastructure maintenance, wastage and excessive consumption, burden our resources. Schalk Mouton explores how we can learn from the current crisis and turn South Africa into a water-secure country for all its citizens. We've heard it so many times before. Every time a government official speaks about water issues in South Africa, they mention that South Africa is a "water-scarce" country. However, until the current water 'crisis' fully developed in Cape Town, and the ominous-sounding phrase "Day Zero' became a daily headline in newspapers, few were actively mobilised around water as a valuable resource. Water has always been cheap and, for the middle-class South African at least, there has always been a constant, reliable supply of water. But will such a situation continue without careful risk management and planning? The current water situation in Cape Town can teach us a number of lessons that could assist us in working towards a more water secure Gauteng – and the country as a whole. "What is going on in Cape Town, scientists argue, is the 'new normal' with climate variability and climate change," says Professor Coleen Vogel, Distinguished Professor in Climate change, Vulnerability and Adaptability at the Global Change Institute. "Although we cannot say with certainty when droughts will occur, projected outlooks are that we could experience more frequent events, such as drought occurring with greater magnitude." South Africa is a dry country. It has an annual surface water runoff (from rain) of 49 billion cubic metres. With an annual rainfall average of 490mm, South Africa has just over half the annual rainfall of the global average of 814mm. Of the water that we do have, 98% is already allocated for use, which means we have only 2% left over as a useable resource. Various provinces, including Limpopo and the North West Province, have struggled with serious droughts in the past 10 years, and the Eastern Cape and parts of KwaZulu-Natal are suffering from water shortages. Gauteng was saved from a serious drought in 2016 (some would argue not necessarily by careful water planning) when good rains fell. South Africa is also struggling to manage water effectively. According to the Department of Water and Sanitation's (DWS) National Water and Sanitation Master Plan, "A call to action," the country "is facing a water crisis driven by a massive backlog in water infrastructure maintenance and investment, recurrent droughts driven by climatic variation, glaring inequalities in access to water and deteriorating water quality." "This crisis is already having significant impact on economic growth and on the well-being on everyone in South Africa, which will be exacerbated if it is not addressed," the DWS says. by 2030 we will have a water deficit of 5%, yet 35% of our municipal water is lost through leakage. 41% of our municipal water does not generate revenue, which, at a unit cost of R6/m³, amounts to R9.9 billion each year. 5.3 million households do not have access to safe household drinking water, while 14.1 million people do not have access to reliable sanitation. 56% of the country's 1 150 municipal waste water treatment works and 44% of the 962 water treatment works in the country are in a poor or critical condition and in need of urgent rehabilitation, while 11% of this critical infrastructure is dysfunctional. The country's rivers are not faring any better. Between 1999 and 2011, the extent of SA's rivers classified as having a poor ecological condition increased by 500% with many rivers pushed beyond the point of recovery. To achieve water security, the DWS says, an estimated "capital funding gap of around R33 billion per year is needed for the next 10 years." In order to find sustainable solutions to South Africa's water problems, all role-players in the water sector should start to work together, says Professor Craig Sheridan of the School of Chemical and Metallurgical Engineering and Director of the Centre in Water Research and Development at Wits. "We need a 'democracy of discipline-values," where policy, economics, engineering, science, social science, law and politics are all treated equally. This can only happen if we can embrace humility as the tool to understanding the other," he says. Even with rainfall figures declining since 2015 (in 2014, Cape Town got 511mm of rain. In 2015, this went down to 321mm and in 2016 and 2017, the region got only 221mm and 153mm of rain respectively) the Cape Town drought was hard to predict. Although the water storage graphs for Cape Town's two main water sources (Berg River Dam and Theewaterskloof Dam) show that both have dropped below "very low" levels since 2015, Professor Barend Erasmus, Director of the Global Change Institute, says that declining surface water levels do not serve as a clear "early warning." "The likelihood of a prolonged drought such as the one in Cape Town is extremely low, so the more years with low rainfall, the less likely it is that a drought will persist," says Erasmus. "The magnitude of the crisis was too big for a 'business as usual' incremental response. This is a typical example of how a system shift in terms of a different attitude towards water is required." Gillian Maree, Senior Researcher at the Gauteng City-Region Observatory, says a more proactive approach towards droughts should be implemented throughout the country. "You cannot solve a major drought quickly. There are no short-term interventions three years into a major drought," she says. "The concern is that we're still reacting to a 'crisis,"" says Vogel. "We need to change the focus of the country. Cities need drought plans and, as far as I know, Johannesburg does not have a focussed drought plan." Maree believes Gauteng can expect to run into water shortages in the near future, with high levels of urbanisation and growth leading to increased demand pressures on the limited water supply. "In the past 20 years, Gauteng has experienced such rapid growth that we just haven't been able to keep pace with it," she says. Johannesburg is expected to become a mega-city by 2030, housing a population of over 10 million people. By that time, over 60% (5.05 billion people) of the world's population is expected to live in urban areas. Urgently deal with the backlog of maintaining water-treatment plants. Compiled from recommendations that Gillian Maree made in a presentation to the Gauteng Department of Economic Development and the Gauteng Department of Agriculture and Rural Development. Some of the earlier Water Balance models from the DWS showed that there would be a water deficit in Gauteng by 2025, says Maree. The idea was to have the second phase of the Lesotho Highlands Water Project (LHWP) operational by that point. Phase 2 of the LHWP is scheduled to increase the current supply rate of 780 million cubic metres of water per year to 1 260 million cubic metres per year. The construction on the project has been delayed. "The LHWP2 is way behind schedule. There's no way we're going to have large augmentation by 2025. This means that the current and future water demands will have to be accommodated for within the current water availability." 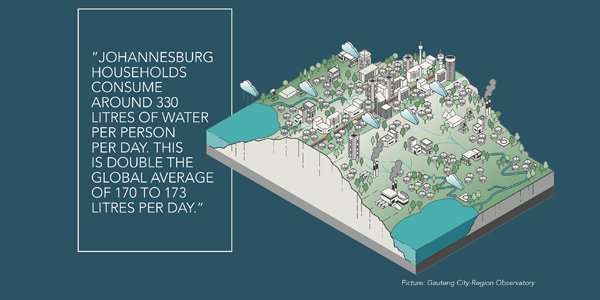 Data on water consumption are very limited and vary greatly across different types of households, but the studies we do have have shown that Johannesburg households consume around 330 litres of water per person per day. This is double the global average of around 170 litres per day. "The consumption here is very high. For those households who have reliable access to potable water, we use nearly double the global average – in a water scarce part of the world," says Maree. "We live in a region far from our water supply, we live on top of a watershed, and we spend great expense piping water here (from the Katse Dam via the LHWP). We have to deal with the consumption and wastage issue." What must also be addressed is the unacceptably high levels of non-revenue water (particularly water losses from poorly maintained and leaking infrastructure) and ensuring that consumers are billed fairly for water, and the revenue collected. A second aspect of water security is making sure that that the water that we do have is safe enough to use. 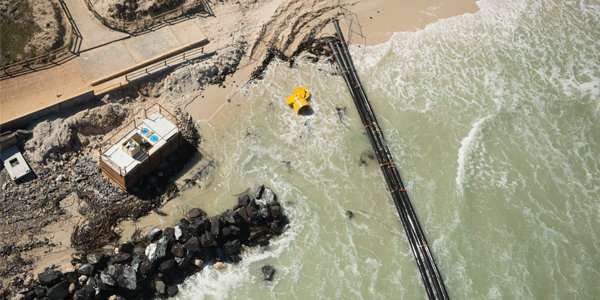 "We are a heavy polluter," says Maree. "Johannesburg lies on top of the watershed, so we pump a lot of fresh water up the catchment to use, and then we release return flows that are often very polluted. We don't see the cost of our pollution downstream, and how we waste water." While industrial wastewater contributes to the problem, Sheridan says the two main sources that pollute our rivers are Acid Mine Drainage (AMD) and broken sewage treatment plants. "We have to fix AMD and sewage plants," he says. AMD is a massive problem, but – if you've got political will behind it – not difficult to fix. The problem, however, is that AMD is usually just neutralised for pH levels, and many sulphates stay behind in the water. This is not good for rivers. "Sewage is a disaster," says Sheridan, pointing out that a lot of research is now going into making water treatment plants on a local level resilient and easy to operate and maintain. However, there is no single solution to fix the problem. "You need to engage with each locality in a different way. You need to consult with local communities and establish their own needs, before you can start to search for a solution," says Sheridan. "How do you design a resilient system for a specific community?" In order to solve our water crisis, we need to change the way we think about and treat water – from a government perspective right down to consumer level. Water must be managed in such a way that consumers value it more. "Effective water management has to be carefully considered," says Vogel. "We need to find socially just ways of ensuring effective water management." Maree agrees: "We have to deal with the consumption and water wastage issue, which is a technical issue as well as a political issue and leadership issue, around changing behaviour." We have to see water in a different light and start to respect it as the valuable resource it is. If we put our minds to it, all South Africans should be able to have a sustainable, water-secure future. As a friend of Sheridan's said: "With political will, everything is possible. We (the human race) put people on the moon because of political will."